This weekend, is a welcome sight. The mere thought of sleeping past 5am, and schlepping around my house in my pjs, drinking coffee with no urgency to leave, is intoxicating! So, that is my plan this morning; drinking hot coffee, sitting in my rocking chair, looking out the window across my back deck. It started raining yesterday, and we have a forecast for more rain today. So, I'm going to welcome the moisture in spirit, and stay warm and dry inside. Later today, Sasha, will be traveling with us into town for a vet appt. She will have her stitches removed and her knees will be checked. I purchased these beautiful pattern papers a few months ago. You know how that is. You are shopping and see some pretty pattern paper, and even though there aren't any immediate plans to use them, you purchase them anyways. And that is how I acquired these pattern papers. The pattern papers come from a collection called Pretty in Pink by Glitz. (The pink rose paper, the music sheet paper, the pink stripe paper, and the pink drawing paper.) I used a die called Tasteful Trim by Stampin' Up! to create the large scallop trim on both the First Edition DSP and the Pink Stripe paper. The crochet trim comes from Spare Parts. 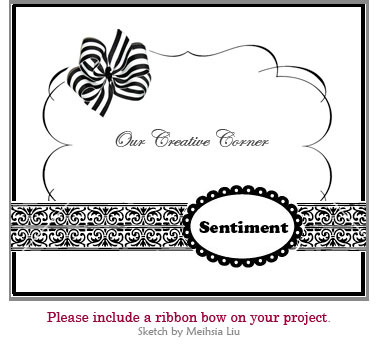 The sentiment tag was created with the flourish from the Creative Elements stamp set and one of the sentiments from the In A Word stamp set. I used foam tape to adhere the circle to the card front. The ribbon bow was created with rose red Seam Binding. I used a random brad to connect the multi-loop bow to the card front. I used a hot glue gun to adhere the resin flower to the brad, by Prima. The paper blossom and the resin frame are also from Prima. The buttons are from Paper Trey Ink. The metal rim butterfly 'button' is from K & Co. Thank you for stopping by. I hope that you have found some inspiration and interest to play along with us @ Our Creative Corner. I adore the idea of sipping coffee & rocking while taking in the view, but here in PA the sun finally made an appearance after a dreary 2 weeks, so I'm enjoying laundry hung outside and fresh air for a change! Your card is SO so pretty with that little framed image and gorgeous paper! I love all the little button and flower accents, but that sentiment is the best! Very nice card!! Yes I will be waited on today, Mothers day is great when you have daughters! What a delightful card you have made Sharon, there is so much in this card....all your gorgeous elements and texture, your Bow is wonderful and connects everything perfectly. The framed image is absolutely brilliant...it caught my eye immediately and I had to read to find out how!!! I love all the extra dimension with the embellies, especially that rose. You make gorgeous bows as well...that is an art, and I can't master it...lol! Absolutely stunning Sharon!!! Such a beautiful card Sharon ... your detailing is impeccable and your styling is oh so chic .... love this fabulous cretion!! !